The first thing I noticed about this book was the fairly small print. When I realized how very detailed the book was, I began to understand that the print HAD to be small, to fit in the amount of information it contains! It includes detailed explanations for every aspect of a network set up, giving the reader an in-depth look at every layer of the network along the way. Ports, switches, routers and cabling, with tips throughout (label each end of your cables … twice). From troubleshooting bad crimping on RJ45 cables, to the pros and cons of various procedures … it’s all in there! Seven step strategies for Network Maintenance, Eight key steps to troubleshooting, and even Human Resources required for roles throughout the levels of support – from Help Desk to Network Administrator. The Network Maintenance and Troubleshooting Guide picks every detail apart, telling you how to troubleshoot, where to look, what tools to use, and how to use them. Very informative! 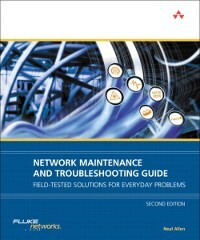 You can purchase a copy of the Network Maintenance and Troubleshooting Guide from InformIT or at fine IT book retailers everywhere. Disclosure: Andrea received a free review copy of the book.